When Alpha Chi Omega sorority students get their hands on A New Leaf’s kids, excitement rises, the children pay attention and seeds are planted. From the Mesa Light Rail to the ASU Tempe Campus, groups of enthusiastic children enter the world of education wrapped in a veil of adventure. 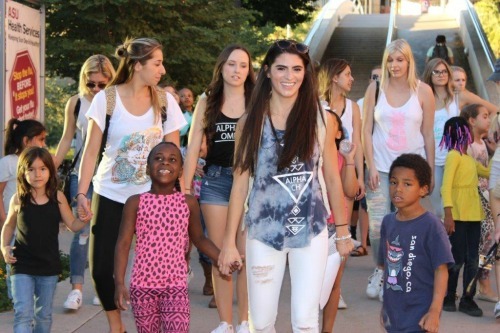 Each year, Alpha Chi Omega Sorority students give A New Leaf children a tour full of amazing possibilities. The mission, designed by A New Leaf staff with the sorority students, is to get these young kids to begin realizing their potential to attend college. With simple curiosity and gratification that comes from receiving special, personal attention, these tender youngsters are prepared to embrace the experience. Laughter moves to wonder, which is where learning begins. Colorful sights and sounds mark new territory for the children. They visit the dorms and classrooms, underground library, and student union. They move on to enjoy the science building filled with live snakes, reptiles and lizards, the stunning Mars research building with live camera feeds looking for the unknown, and the athletic facilities, all surrounded by teens and grandparents – a thorough picture that anyone can go to college. In addition, they learn about minority, foster care and other available scholarships. With Alpha Chi Sorority Students as their mentors, A New Leaf children get a glimpse of many things that kids don’t often know they can experience going to school. The seeds are planted. Because of you, A New Leaf provides much more than a band aid in an emergency situation. To achieve our mission of Helping Families…Changing Lives, we strive to provide life skills training, education and support for children and adults that lead to transformed, balanced and successful lives. We couldn’t do this without your help. Thank you for your ongoing support.